1885. British Chess Association. First prize. 1887. British Chess Association. Tied with Burn for first prize. 1888. Bradford. First prize, beating Mackenzie and Bardeleben. In matches he has beaten Bird by 5 to 1, and Blackburne by 5 to 2; drawn with Tschigorin, 9 all; and scored 4 to 6 against Steinitz. He is also very successful in simultaneous play. 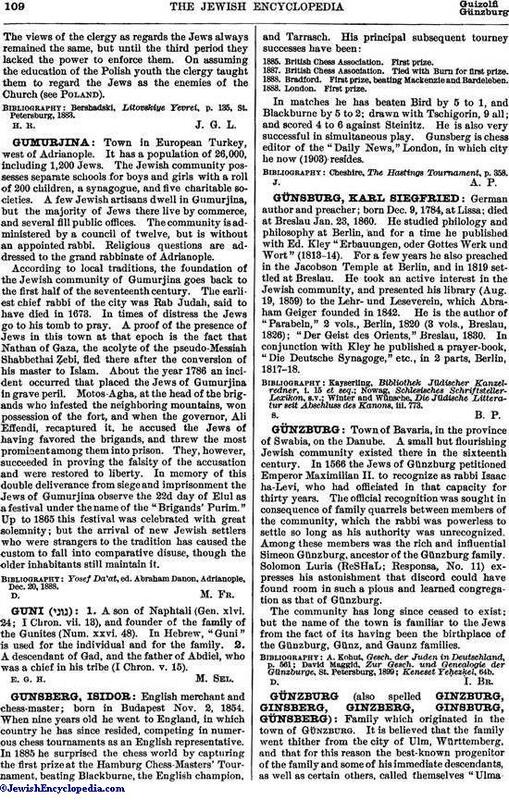 Gunsberg is chess editor of the "Daily News," London, in which city he now (1903) resides. Cheshire, The Hastings Tournament, p. 358.